In early February the stock markets saw a historic sell-off. The Dow Jones for the first time lost more than 1000 points in a single day, and then it did it again. Back then, there was little to no talk about any trade war with China and certainly no concerns about big data. The narrative of that sell-off was about incoming inflation and how the Fed may react. The Fed chair Jerome Powell was largely able to allay those fears during their March meeting by maintaining that any tightening will be gradual. However, the minutes of that meeting released yesterday tell a different story. The market reaction to this does seem to have been muted…. so far. Perhaps drowned out by the geopolitical news. My assumption is that it will be a topic that comes up in portfolio manager meetings today. Huge kudos to the home of the Kangaroos for following in the footsteps of Japan and South Korea by introducing new crypto-friendly regulations in the country. Crypto exchanges are not only legal now but will be subject to the regulations of AUSTRAC, the Australian Transactions Reports, and Analysis Center. 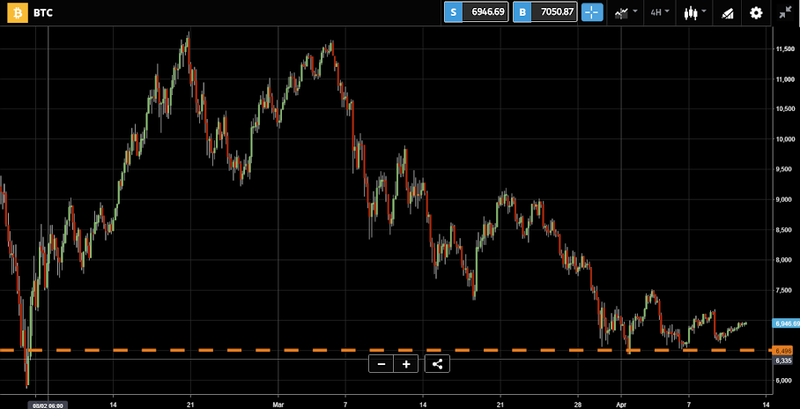 Bitcoin has been holding a strong support at $6500 for the last few days. Though it may end up breaking this level, it does seem that the bearish momentum and sentiment is giving way. Within the crypto market, many are celebrating a different kind of milestone. One of the first ICO’s ever has just released the first iteration of their Ethereum based platform. This innovative company known as Golem aims to be the Air BnB of computers by allowing people to rent out unused computing power. Though there are some concerns about network scaling should this app go viral, the price of Ethereum is up sharply following the successful product launch. This is a log scale chart of Ethereum, which shows the relative percentage movements. It’s been a long journey so far and though this last pullback may have been gut-wrenching for those who got in at the top, we’re still several orders of magnitude above the prices of last February. Are Trade Tensions Slowing Down China’s Economy?